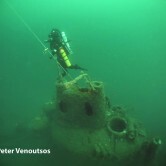 Nazi U Boat U853 Submarine Wreck Dive Charter to The U853 Join us as we dive the U853 Nazi submarine, a Type IX-C-40 built in the Deschimag Yard in Germany. We will remain at the U Boat for the second dive according to conditions. This Charter and Giant Stride Dive Shop, requires an advanced cert. with some experience diving to depths greater than 100 ft. in New England (or similar) waters. Maximum Depth is 125′. Advanced Open Waret Certification, A redundant air source, lift bag or safety sausage, and whistle or horn is required. Pony bottles and regs are available to rent if you don’t have one. Cost is $145.00 per diver and only 6 spots are available. Reservations are made by full pre-payment that is non refundable. You must have an Advanced Open Water Certification(please bring c card & log book in when you sign up). Required equipment: redundant air sourse, SMB or safe-t-sausage, & Whistle. Cost: $145.00 Reservations are made by full pre-payment that is non refundable. If you cancel your reservation you forfeit the full payment if we can’t sell your seat….if our captain cancels the trip, we issue a full refund. Cancellations by our Captain are made on the day of the charter, one hour before sailing time. We cannot guarantee dive sites, alternate dive site selection does not constitute a cancellation or a refund. Please be at the marina at 33 State St. Galilee 1 hour to a 1/2 hour before sailing time, to fill out a waiver, present a certification card and get fully loaded 30 minutes before departure time. Our boats sail on time and if you miss the boat it’s your loss.